A lot late on the updates around here. Summer is proving to be a busy and fun season for me. 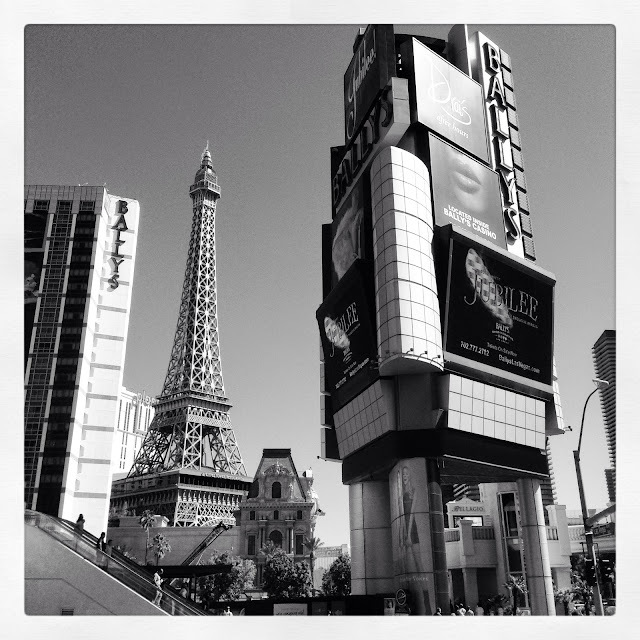 I took a little jaunt to Sin City, Las Vegas, the end of May/beginning of June. The town could also be called a true foodie destination. I'm not a gambler but I am an eater and I hit up plenty of winning locations for outstanding meals during my 4 day stay. The trip was a get away with my best friend, Rachel. She lives in Tucson, AZ; Vegas felt like a good meeting place for the two of us that would provide many options. Photographic excursions, possible shows (we didn't take in one darn show!!) and lots of people watching. That we had in spades. The food finds were plenty. As I said it's a food destination. Once you get past the brand named chef driven restaurants there are plenty of true non-corporate non-chain places to dine. 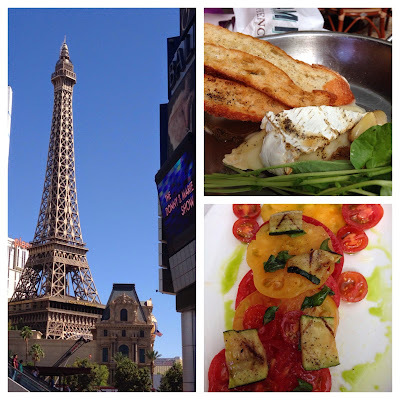 If you want the big brands and top dog culinary faces then Vegas is truly the town to go for the food. Rachel and I are the type of people who want to find the hidden gems. The honest and local cooking. 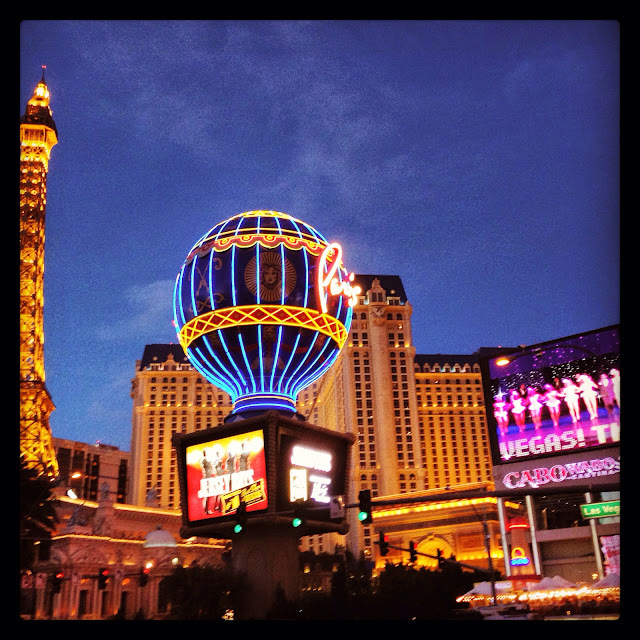 We don't go for the glitz and fabricated glamour for which Las Vegas has become synonymous. 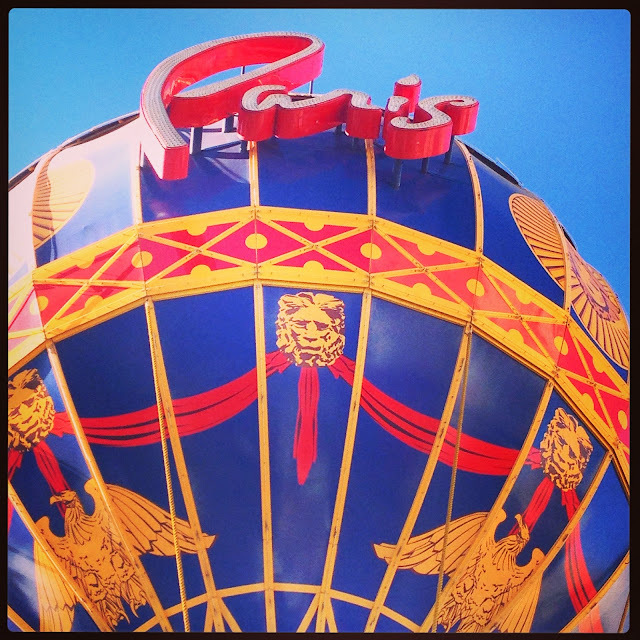 For two gals who didn't want to throw our pennies away, not into the slots or the Bellagio fountains, Las Vegas sure has a way to help you part with your money whether or not you want and/or realize it! The biggest way your money disappears is in the high charges on the incidental in the hotels or associated shops, cafés and other "connected" business. All inferences intended. The mob "might" not exist. It's been replaced by the corporate mafia. And there only a handful of syndicates operating this town. The corporate fabrication of Las Vegas is of course noticeable in the Cirque du Soliel fantasy world of The Strip and the Food Network driven Marque Restaurant scene. We ate a few surprisingly pleasant and reasonably priced meals at the big names hotels. 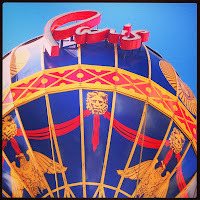 Our first stop was in The Paris Hotel's bistro, Mon Ami Gabi. I read about it in one of my guide books so we thought we'd give it a try. Once we stepped inside this artful replica of The Eiffel Tower and its street level dining EXPERIENCE we were sold on the whole theme. 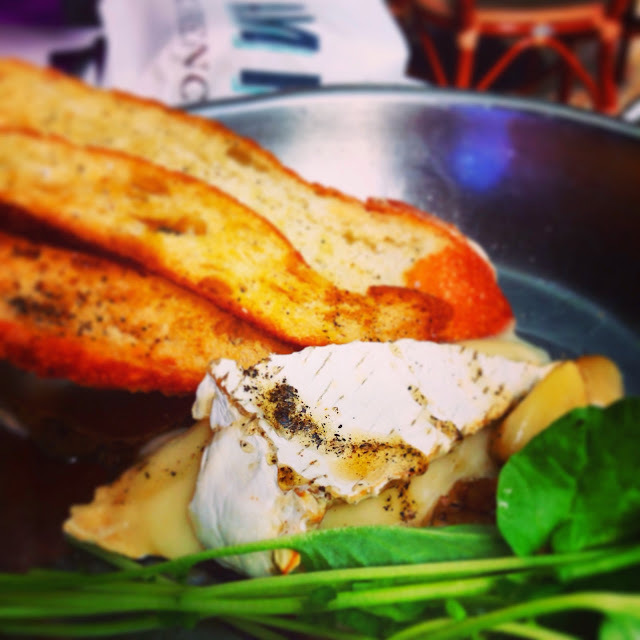 It didn't hurt that the bistro was very similar to our favorite Philadelphia Parisian bistro fabrication, PARC. Cool ambiance. Attentive waiters. Authentic bistro menu and of course the all important glass of an afternoon aperitif to set the mood. Add in a surly looking old waiter cast out of the Guy Savoy agency and the mood was set. Eating a full meal in the late afternoon didn't seem quite right if we were them going to have a big dinner in the evening. So we opted to share a light dejuener. A salad of grilled summer squash shaved super thin over heirloom tomatoes and topped with chiffonade basil and basil oil. We also had a baked wedge of Brie with truffle honey, toasted hazelnuts and watercress. Along with my sparkling wine and a Demi baguette perfectly baked we were set! And well lubricated on my part. Suddenly things were looking a lot nicer than the Daytona Spring Break scene we encountered upon arrival! Since this meal, I've been craving tomatoes - a miracle to those who know me well. I tend to dislike tomatoes unless they are cooked or in salsas. These tomatoes were succulent. Meaty. Full of flavor like I've never before experienced. 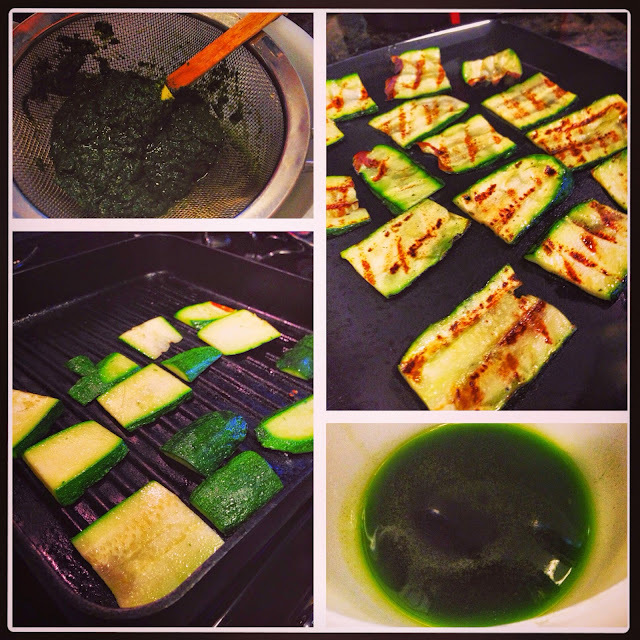 I loved the simple way the zucchini was cooked. Grilled super thin slices. All components of things I've had or done before but put together in a completely new way. 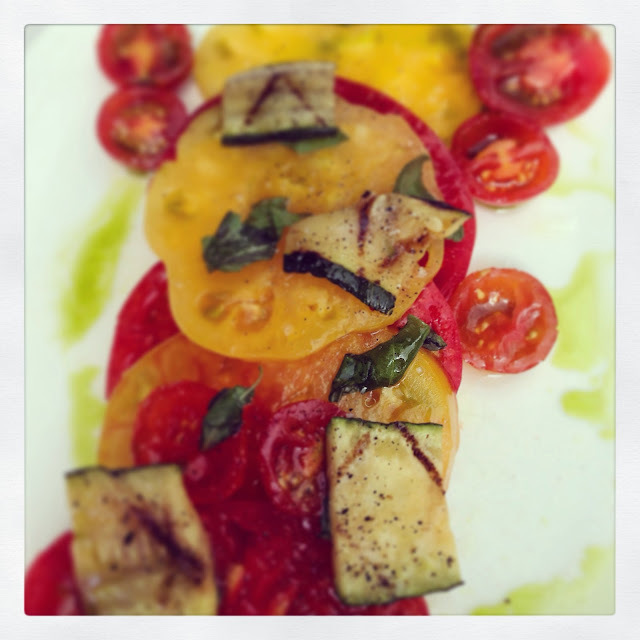 Local farm raised, sun ripened tomatoes aren't available on the East Coast yet. We're about a month or more away from those babies. Jersey zuchs are available now, so I made do with those instead. I whipped up a batch of basil oil, straining the basil from the oil and saving the basil "sludge" for later use in a quick pesto or addition to sauce or vinaigrette. To make this meal really "sing" its summer song you have to slice the zucchini very thin, but not paper thin. About 1/8 inch thick, and then grill it on an indoor grill pan on both sides. You give it a bit of char for flavor and visual appeal. Season to taste with salt and pepper and drizzle with a bit of basil oil. The grilled zucchini makes a lovely side dish to a fish or chicken dinner; over a salad with a bit of cheese, or on a sandwich with a schemer of good goat cheese. My recipe for Basil Oil has been posted before. You can find the full description, details and step by step photos here at this link. The quick version is this: Blanch a large bunch of cleaned basil leaves in a pot of salted boiling water for 30 seconds. Strain the basil and shock it in cold water to stop the cooking and set the color. Puree the basil in a blender for food processor with 2 to 4 cups of light olive oil or neutral vegetable oil. Let the oil and pureed basil sit in a clean covered container in the refrigerator over-night to let the basil flavor permeate the oil. Strain the oil over a fine mesh strainer, reserving the basil oil in one clean container. Refrigerate the oil. Reserve the basil puree for other uses - such as making pestos, adding to tomato or other sauces, vinaigrettes. Both the basil and the oil can be frozen in small batches, such as in ice cube tray compartments. Use the oil and the pureed basil with in 2 weeks. Frozen, both will last for months.